Your Jacuzzi is probably one of your biggest investments at home but maintaining it is a daunting task. To properly maintain your Jacuzzi, start by preparing your cleaning agents. You’ll only need a dish washing detergent and commercial bleach. – Fill the Jacuzzi with water until the jet openings are under water. – Add ½ cup of bleach into the water along with two spoonfuls of dish washing detergent or 4 tablespoons of dish washing detergent in powdered form. – Turn on the Jacuzzi jets and allow them to run for about 20 minutes. 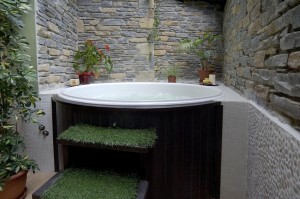 – Drain the Jacuzzi out and refill it with plain water. – It will be a good idea to run the jets for another 15 minutes.